I love finding pieces of treasure that I can incorporate into my art. Blue beach glass is very difficult to find on our beach therefore this piece is particularly special to me. Roaring Sea is a mixed media piece. The rich blues greens mimics the colors of the sea. I have always liked the idea of recycled art. Or trying anything that is different or unique. So when my husband made a really strong batch of coffee I decided to see if I could paint with it. Like so many ideas once I decided to try it, it never comes off just like how you want it to. I came across quite a few obstacles in which I had to be creative, one such problem was I found it difficult to get really dark colors. The first painting had very little color contrast and I was determine to create contrast in the next one. After that I made the coffee stronger, tried different brands, boiling the water out trying to make it more concentrated or leaving the coffee for a couple of days. A heads up if you leave it too long it gets moldy. I also had to do a lot of layering to create the really dark tones. I wanted to make the painting more visually appealing especially since as the picture was monochromatic. So I created texture using the salt technique. If you look around my initial you can see white spots this was created by using salt when the coffee was wet then leaving it to dry and dusting it off after. This is one of the first painting I did before I managed to get the process down. As you can see there is very little contrast in the painting. If you decide to try it please leave me a message and let me know how it turned out. As an artist I find there are so many things I want to try. I found out about Zentangle while at work. During my walks through the call centre each day. I walked by a certain rep whom in between phone calls her head would be down. One day I asked to see what she was doing. At first I assumed it was doodling then she educated me on the difference between Zentangle and Doodling. I forgot about Zentangle for years . Now that doodling is so popular it prompted my memory. I decided it was time to give it a try. 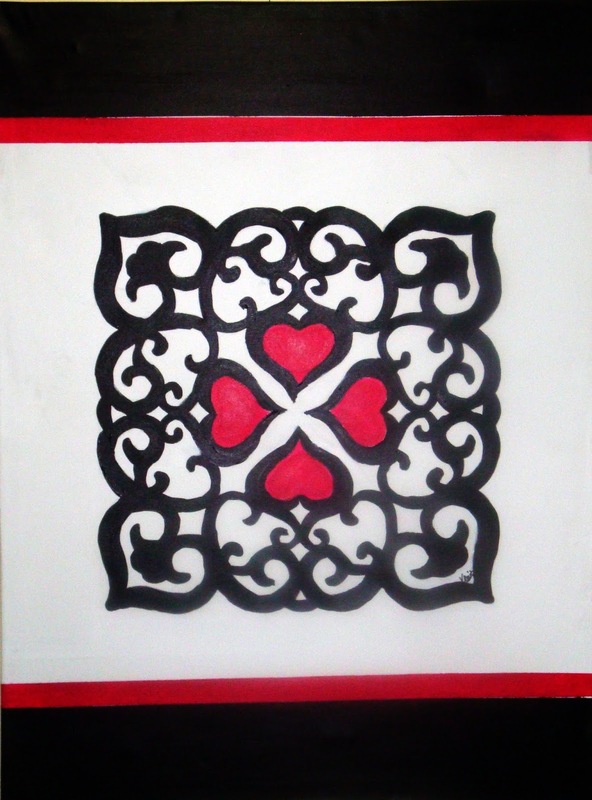 Zentangle is a repetitive patterns, it's also well thought out. Doodling requires no thought you go with the flow. The artist draws whatever come to mine. I thought a colored background would have more of an impact instead of the usual black and white background that most of the Zentangle I found on the internet had. The back ground was created by using a salt technique in which you add salt to the paint then leaving it to dry. Large grains of sea salt create more of a dramatic effect. Once dry remove the salt. The background was then ready to create what ever master piece you want. If you have no drawing skills trace the outline of a shoe then have at it. I love the rich gold of the background. Since this was my first time I used simple patterns. Check out the video link for full tutorial. 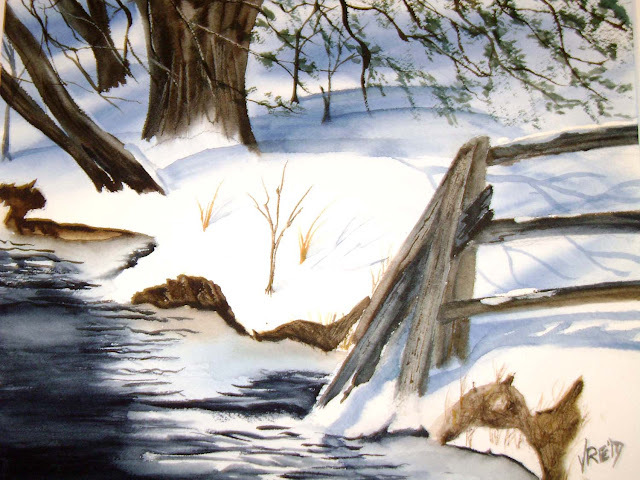 This painting is one of my favorite water colors, when my son Joshua was younger I would take him down to the creek in winter and summer and play endlessly in the creek. Beach Glass are found on beaches along oceans, bays, rivers or large lakes that has been tumbled and smoothed by the waves, water and sand, creating smooth, frosted shards of glass. The color of beach glass is determined by its original source. Most beach glass comes from bottles, but it can also come from jars, plates, windows, windshields, collect beach ceramics or pottery. The most common colors of glass are kelly green, brown, and clear. These colors come from bottles used by companies that sell beer, juices, and soft drinks. Seafoam Green - While the most common source for this lovely shade of light green glass was most likely an old Coco Cola bottle made in various parts of the world. The shades vary from a light sea foam green to yellow green to light aqua's. Transport was difficult so many of these bottles were manufactured locally, hence the color variations in old coke bottles. A lot of older white glass however, had a greenish tint and depending on thickness and whether bubbles are present, could be an old piece of rarer glass. New glass of this shade is still used for wine bottles. Create your own artwork. 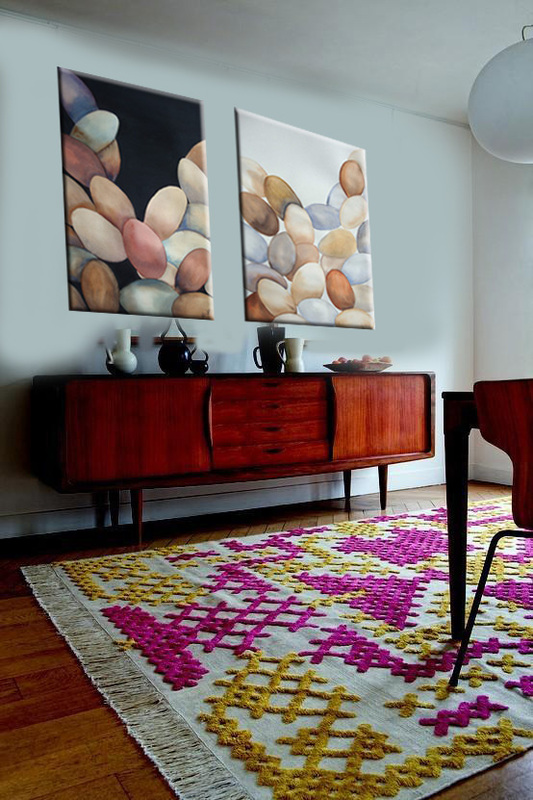 Modify the colors to match your room. It would look great with lime green instead of the hot pink. If you decide to do this painting and modify it send me a picture. I would love to post it on my blog for others to enjoy. 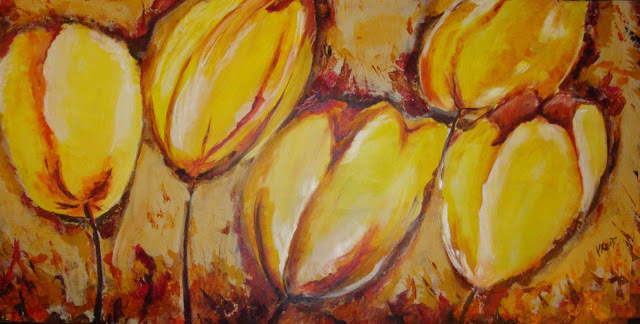 This painting was inspired by the bright colors of summer. I love the sound of the birds the vivid flowers, and bright clothes. The loose painting style mimic's the flow of water. Many of my pieces contain beach glass I have written a little blurb on what beach glass is. 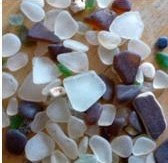 Beach Glass is found on beaches along oceans, bays, rivers or large lakes. They are pieces of glass that have been tumbled and smoothed by the waves, water and sand, creating smooth, frosted peices of glass. The color of beach glass is determined by its original source. Most beach glass comes from bottles, but they can also come from jars, plates, windows, and windshields. Sea foam Green - While the most common source for this lovely shade of light green glass was most likely an old Coco Cola bottle. The shades vary from a light sea foam green to yellow green, to light aqua. Transportation was difficult so many of these bottles were manufactured locally, hence the color variations in old coke bottles. A lot of older white glass however, had a greenish tint and depending on thickness and whether bubbles are present, could be an old piece of rare glass. New glass of this shade is still used for wine bottles. Kelly Green-These colors come from bottles used by companies that sell beer, juices, and soft drinks. Heineken, Beck's or Presidente beer, and 7-up bottles. Jade, amber -(from bottles for whiskey, medicine, spirits, and early bleach bottles), less common. Golden amber -or amberina (mostly used for spirit bottles) less common. lime green- (from soda bottles during the 1960s), forest green, and ice- or soft blue (from soda bottles, medicine bottles, ink bottles, and fruit jars from the late 19th and early 20th centuries, windows, and windshields). 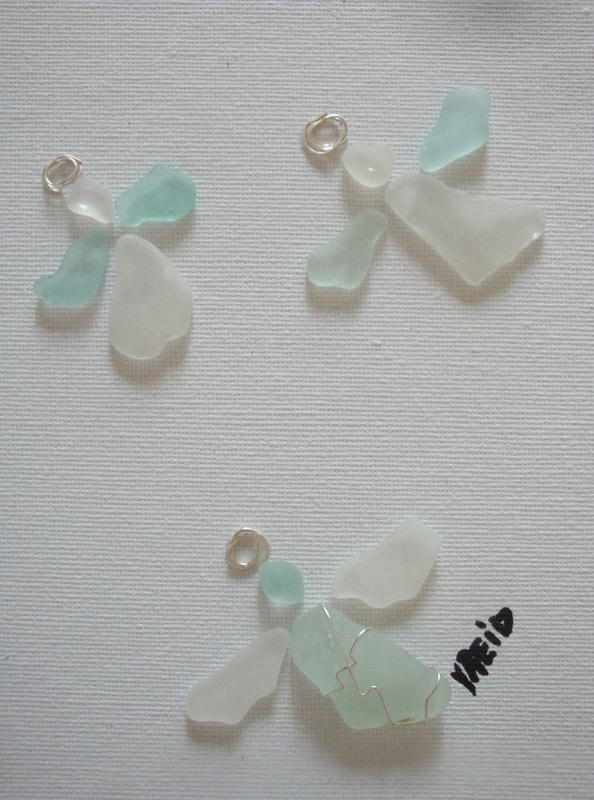 These colors are found about once for every 25 to 100 pieces of sea glass found. Gray, (often from Great Depression-era plates), teal (often from Mateus wine bottles), black (older, very dark olive green glass), yellow (often from 1930s Vaseline containers), turquoise (from tableware and art glass), red (often from old Schlitz bottles[ car tail lights, dinnerware or from nautical lights, it is found once in about every 5,000 pieces), and orange (the least common type of sea glass, found once in about 10,000 pieces). These colors are found once for every 1,000 to 10,000 pieces collected. Some shards of black glass are quite old, originating from thick eighteenth-century gin, beer and wine bottles. 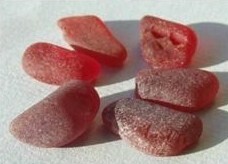 Red rubies-of the beach, might come from perfume bottles, the tail lights on old automobiles, and lanterns. How high should I hang a picture above my sofa? Great question! The ideal height to hang a picture is one of the most common question people ask. Most people hand artwork too high. The general rule of thumb is to hang your artwork so that the subject of the picture (usually in the middle) is centered to the eye level of the viewer. Because people come in all different heights, shoot for about 5’8″ which is usually a good height. That said, if the picture will be going in the living room in an area where people will be sitting, the ideal artwork height will be a bit lower than it would be in a foyer or hallway. The size of the artwork should relate to its surroundings. A small picture on a large empty wall will get lost, while a large picture will overwhelm a small wall. Pictures should be smaller than the furniture over which they hang above. 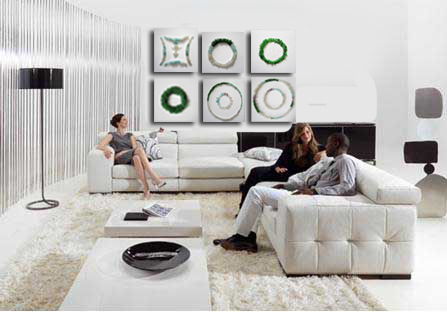 For example, a large painting hanging over a tiny table will look unbalanced and top heavy. Your picture should hang between 4"-8" above the back of the table. If you don’t have a picture large enough to hang over your large furniture or large walls consider hanging pictures in groups. The first benefit of owning original art is its aesthetic quality. Hanging art or sculpture enhances the room in which it is displayed and this is often the prime consideration when someone is thinking of buying art. Just knowing that it completes your interior can lift the mood of the room, including the mood of the occupants. Additional paintings and sculptures provide a focal point for rooms. A wall hanging can compliment, or contrast with, the surroundings in which it is displayed. If it is bought to blend in with the décor then it is likely to be the finishing touch on an otherwise perfect room. However, many people prefer to have the piece stand out from the rest of the room. This will undoubtedly ensure that the artwork is noticed, and admired, by everyone. Many people will appreciate the quality of an original art piece and the impression that it gives is one of individuality of the owner. 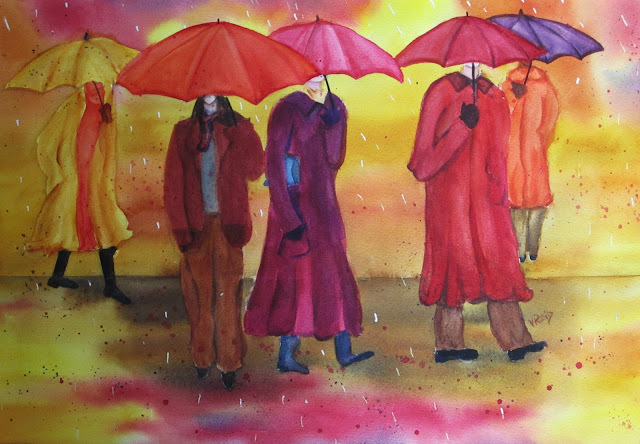 Depending on the size and type of art, it may also lend an air of success to the lucky buyer. This is particularly the case for original paintings or bronze sculptures. The impression of wealth may not be founded in reality, but it is often the impression that counts. A person might prefer to have a number of smaller pieces of a particular artist or sculptor, or buy the largest that they can afford. It really makes no difference. As long as it is pleasing to buyer. Continuing on the topic of wealth, there is no doubt that pieces of original art tend to increase in value over time. Many people have no intention of selling the work that they have just purchased, but the fact that it can be the an inheritance for their children maybe another reason for picking that piece of art. There are many benefits to owning original art; however the most important one by far is simply for the love of it. Original works of art should be appreciated and give many years of joy to the new owner.